Before Jim Marshall got famous for the pictures he took at the 1967 Monterey Pop Festival — Jimi Hendrix torching his ax onstage, Janis Joplin lounging backstage with her pint of Southern Comfort — he took vital, up-close pictures of jazz musicians on that same Monterey County Fairgrounds stage, in New York clubs and in more intimate offstage settings. Marshall, a San Franciscan who died in 2010 at age 74, took some classic shots of Miles Davis, John Coltrane, Thelonious Monk and other jazz artists who felt at ease around the irascible photographer, whose unfettered access to the Beatles, the Rolling Stones and other rockers produced singular pictures. 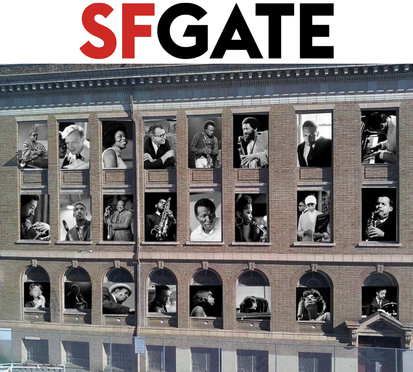 Some of those pictures are among the 24 Marshall portraits that have been blown up to 6 by 10 feet and placed in the west-facing windows of the old San Francisco school district building across Franklin Street from the SFJazz Center. The images that went up last week replaced the bracing jazz portraits by photographer Herman Leonard, installed in 2013 (a second set of those prints was made to replace the first sun-faded batch). Chosen by noted San Francisco photographer Jim Goldberg in consultation with SFJazz’s Randall Kline, the pictures include classic Marshall shots like that Monk from Monterey and a contemplative Coltrane backstage at Stanford in ’66, mixed with fresh images of important San Francisco artists: the late tenor saxophonist Joe Henderson, the late drummer Tony Williams and singer Mary Stallings, one of this season’s SFJazz artistic directors. “Jazz is about being present, and Jim Marshall knew how to get close to people and be present,” says Goldberg, SFJazz’s photographer laureate. He grew up on Marshall’s pictures of rock musicians — “I dreamed of being a rock star myself,” he says — but didn’t really know his jazz work until this project. “There’s an elegance to these images,” says Goldberg, whose own documentary photographic books include “Rich and Poor,” a potent 1985 look at San Franciscans of radically different means, and 1995’s “Raised by Wolves,” about runaway and homeless kids. Goldberg is finishing up a partially autobiographical, Yale-funded book about his hometown, New Haven, called “Candy” (his father was a wholesale candy distributor). Perusing about 50 possible images for this installation, Goldberg says he picked the ones “I felt visually were important” and showcased some of the influential San Francisco musicians who’ve enriched the city’s culture. Goldberg met Marshall once, but never saw him in action. The late, great San Francisco critic Phil Elwood did. In his intro to Marshall’s “Jazz,” Elwood wrote how fascinating, unnerving and entertaining it was to watch him work.